Get them to take an action. How to do this is really not rocket surgery. It’s a skill that this book will teach you in 16 steps for less than your daily latte ($2.99 on Amazon). I don’t care how many years you have been writing copy for web pages (I’ve been doing it since 1993), there is something for everyone in this book. 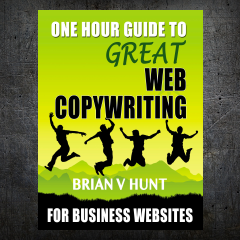 The book contains 16 steps that will help you be a better web copywriter. 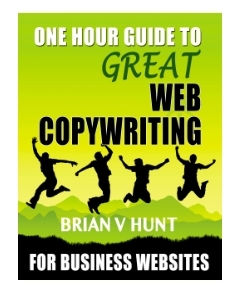 As the author states, “…if you put these 16 steps to work, I guarantee it will make you a better web copywriter.” I concur. I wish I had written this book, but I know I could not have done as good a job as Mr Hunt. The book’s title implies that it only takes one hour to read and digest the information in the book. It took me a little longer, but that’s okay, because the book is chock full of practical and very useful instruction on writing web pages that sell your product or service. It’s divided into sixteen steps that will help you to speak to your target audience using words and images that will grab their attention. This guy can make you laugh right in the middle of a sentence that would otherwise be dry and flat. He talks to himself, he contradicts himself but it all comes with a good feeling that you getting your moneys worth. Don’t Get me wrong, he does come out with some pretty heavy stuff with psychology and comparisons. There is a lot of serious things to consider in this business plan for a book but you will keep on turning pages I guarantee it.